Travertine that has become dull and damaged will need professional services to restore its elegant luster or rustic charm. At Carter’s Floor and Surface Care, we know what it takes to make your travertine surfaces look amazing… all over again. If your travertine is dirty or dull-looking, scratched, etched, cracked, chipped, or otherwise damaged, don’t replace it! Our cleaning, honing, polishing, restoration and protection services can make an incredible difference. We provide complete travertine care and professional maintenance services for floors, countertops, shower walls, and other surfaces, for residential and commercial clients. Keep reading to learn more about how we can meet your needs. Does your travertine floor have dull areas associated with wear patterns, scratches, etches or spots? An uneven finish, dull spots or etches can diminish the elegant appearance of your travertine floors. Carter’s Floor and Surface Care can hone your travertine surfaces to eliminate these imperfections, resulting in a new travertine surface free of damage. With our travertine honing and polishing services, our expert technicians can achieve a honed or soft matte finish that is warm, inviting, and velvety smooth, or we can polish your travertine using the appropriate diamonds and polishing powders to achieve a semi-gloss or gloss finish. Are your travertine tiles uneven? Do you want your tile floor flattened to the grout lines to facilitate easier cleaning? We can grind away the excess stone (a process called lippage removal) to create a flat, level surface using state-of-the art diamond grinding technology. Once ground level, the travertine can then be honed and polished to the finish you want. Travertine is a unique stone in that it has naturally occurring holes. These holes are either left unfilled on purpose, for a rustic, casual look, or they are filled in for a more elegant appearance. If you want to have your unfilled travertine filled, or if the holes in your filled travertine are coming loose or reappearing, we provide expert travertine floating services. 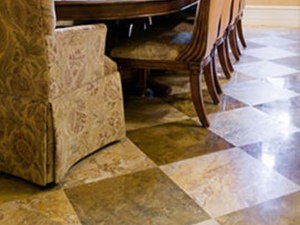 Do you have chipped, cracked, or broken travertine tiles? Our expert travertine repair services include filling in chipped areas in travertine, fixing travertine cracks, blending the repair site with the surrounding area, and honing and polishing it to match the finish on the rest of your travertine floor, countertop or other stone surface. Although it is rare for a travertine tile to be beyond repair, sometimes tile replacement is necessary. Carter’s Floor and Surface Care craftsmen can, in many cases, remove your affected tile without damaging neighboring tiles, reinstall the new tile, level the installed tile with the surrounding area, and then match the finish as closely as possible. Whether you are seeking guidance on how to remove travertine stains or discolorations yourself or want us to treat your travertine, the original finish of your stone will, more often than not, be restored. Travertine is easier to keep clean with periodic professional deep cleaning services, using non-acidic, highly-effective cleaning solutions. Once your travertine is cleaned and restored, we may recommend you have us seal it to enhance its stain resistance. We say, “May” because not all stone needs to be sealed. Highly polished travertine may not even take an impregnating sealer. But, if sealing is recommended, know that sealing represents an inexpensive, preventative measure against travertine stain damage. At Carter’s Floor and Surface Care, we can instruct you on the proper day-to-day care of your natural stone and tile floors, countertops, and other surfaces. Visit our Caring For It page where we offer a free, downloadable Stone and Tile Care Guide and recommend stone-safe care products to help you keep your home or business looking great. For a FREE estimate on travertine floating, travertine floor polishing, travertine cleaning and sealing, or other travertine services in the Tampa metro area, fill out our online contact form or call (813) 787-3920 today. Gregory initially started his career in the construction industry way back in 1975 because of his sincere interest in how do the new buildings and structures get built from the ground up. Eventually, after working at the construction company for quite a long time and achieving an executive-level position there, Gregory decided to adjust his career course a bit and focused on home remodeling & renovations. Excellent cleaning! They are awesome at what they do. Affordable prices. Check them out! 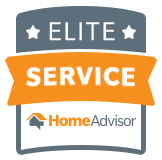 Carter's Floor and Surface Care has a well-earned reputation throughout the Tampa / Clearwater / St. Petersburg area for quality surface care. 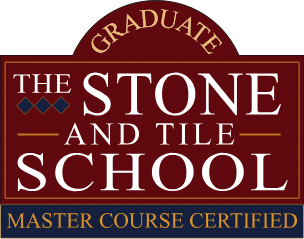 We are members of the BBB and have had professional training for each of the surfaces in which we specialize.